'Very well sung, boys!' cried the Rat heartily. 'And now come along in, all of you, and warm yourselves by the fire, and have something hot!' 'Yes, come along, field-mice,' cried the Mole eagerly. 'This is quite like old times! 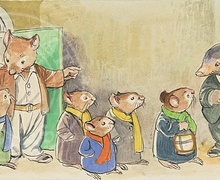 The Wind in the Willows has been illustrated by numerous artists. This is one of the many illustrations Philip Mendoza produced for a serialisation of the story in the magazine "Treasure" during 1974-5. 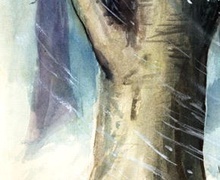 A selection of the artwork was then pulled together for a book. 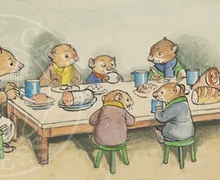 This image appeared in The wind in the willows by Kenneth Grahame, Barbara Sleigh, Philip Mendoza. This ORIGINAL WATERCOLOUR painting by Philip Mendoza was for a 1983 edition of Kenneth Grahame's 'The Wind in the Willows'. Image size: 9.4" x 4.5"
Framing: Supplied with a warm ivory mount and backing board to fit a standard 14" x 10" frame.